From the mesmerizing sunrises to s’mores under the stars at the fire pit, you will make amazing memories during your stay at Dogwood Overlook! When you first arrive, you will walk on the main deck and take in the long range mountain views. Once you are inside you will find this cabin features 3 beds and 3 bathrooms on three levels. There is a bedroom and bath on each level. 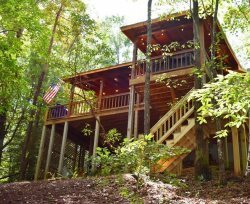 The Master is on the upper level and features a vaulted ceiling, king size log bed and private bath with walk-in closet. You can walk across the loft area to a private balcony to watch the sunrise and then crawl back in the big cozy bed. The main level has a spacious kitchen with brand new appliances, granite counter tops and a breakfast bar. The living room features a bold, river rock gas fireplace and the dining room has a beautiful dogwood log dining table that easily seats six. The main floor guest room has a queen log bed, private access to the bathroom and private access to the wrap around deck. The terrace level has guest room with a rustic queen bed, bathroom, family/game room with pool table and flat screen TV. With three spacious wrap around decks you can step outside into nature, relax in the hot tub, enjoy dinner at the outdoor dining table while gazing at the long range mountain views or follow the winding trail to the creek and the outdoor fire-pit. You’ve found your special place. Located just minutes from the quaint mountain town of Blue Ridge GA, this is a GREAT location for those who want to visit the local antique shops and events happening in the area. The outdoor activities are endless in the north Georgia mountains where Hiking, Kayaking, Tubing, White Water Rafting, Paddle Boarding, Horseback Riding, and Zip-lining are all right at your fingertips. You can also visit the Waterfalls, Hike to a Swinging Bridge, or take a more relaxed approach and enjoy a great meal at one of the many wonderful restaurants or breweries located in downtown Blue Ridge. Don’t forget to take a ride on the Blue Ridge Scenic Railway, be entertained at the Big Foot Museum or step back in time at the local Swan Drive-in Theatre. There is something for everyone in the mountains! The cabin was better than advertised! Very clean and the beds were great! Looking forward to the next time. The cabin is great. Location is short ride from Blue Ridge on a cool little road named Hardscrabble! The cabin has long range views and we got to experience a brilliant sunrise, rain storm and snow all in our visit. The neighborhood has gravel roads that are perfect for walks, might even see a turkey. The cabin has a great entertainment features if you want to hang out. From big TVs in the rooms, a pool table downstairs and a hot tub on the back deck, there is something to do or not do and just relax. Great deck space on all three levels of the cabin with seating for everyone in your group. There is also a neat little fire pit down by the creek. Follow the lit path down in the evening for marshmellow roasting. (HINT: Ingles Grocery has marshmellow kits for sale in Blue Ridge) We used the cabin as jumping off point for a couple day trips into Franklin, NC and Ocoee National Park in TN. You can also go into Blue Ridge for great meals or walking through the town. We also enjoyed a few of the local breweries in the area. Stop in. Friendly people at all the places we visited! We will definitely be back to take more of the beautiful area! Easy to get to, convenient location in the Blue Ridge mountains, we can't wait for our next trip to Dogwood Overlook.